The aim of this workshop is to introduce a probability-based statistical investigation that can be carried out using the features of the software TinkerPlots. We will answer the question asked by Cliff Konold in 1994: Will changing China’s one-child policy to a one-son policy cause a population explosion and/or result in an oversupply of girls? Following the four stages of a statistical investigation (pose question, collect data, analyse data, make decision) the process illustrates the five Big Ideas that form the conceptual foundation for statistics at the school level. 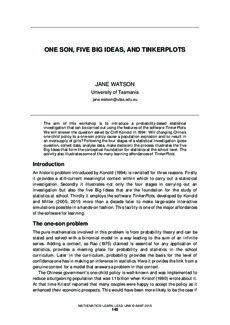 The activity also illustrates some of the many learning affordances of TinkerPlots.